Recently I wrote about a LinkedIn improvement which offers an easier way to start a conversation. This appeared in a blog article about LinkedIn changes to its navigation and some new tools. 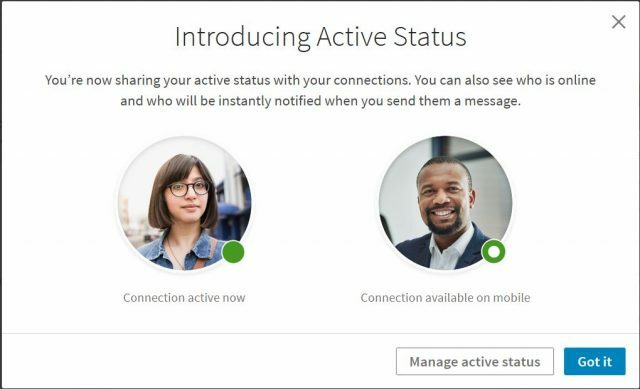 LinkedIn will now alert you to your connection’s status while you are online. This is similar to instant messaging alerts on Skype. Well, the update did hit my profile late last week. Note: Because of the vast expanse of over 400,000,000 LinkedIn members ranging over multiple servers, roll outs do not all happen at once. To review, in the blog article I showed you that a green dot next to your connection’s profile photo indicates when someone is online. Here is that image once more. Notice the green dot at about 5 o’clock. While a white circle within a green dot tells you your connection is on mobile. LinkedIn will send notice of your message to your connection. The notification appears in your < Messages > window. The notice appears for an active connection recently messaged (or vice versa) on the left sidebar. Or it will appear in a search query for a connection. When you get the message, you should go to your settings by clicking on “Manage active status” to ensure it is set the way you want it to be. Simply leave the default ‘Yes’ if it is OK to display your active status, as I did on mine, or ‘No’ if it is not alright. Note below that you can leave the status as OK and also select individuals you wish to hide your active status from. When you start typing in the name of a connection, LinkedIn will auto suggest names for you again see below). Then merely select who you wish to add to your purgatory list. Click on < Me > which is your icon on the top LinkedIn navigation bar. Under Account, click on < Settings & Privacy >. In the new window, in the middle column, click on < Privacy >. The second choice down in the middle column is< Manage active status >. Click on < Change > in the right column to check status or to add someone to your list of expunged. Why is Active status on LinkedIn a valuable tool? At times just beginning a casual conversation and opening a line of communications can present a big sales opportunity. Being at the right place and the right time is a definite possibility. It also benefits you to stay ‘top of mind’ with customers and prospects. When someone is active you may get immediate feedback on your communication. Then you have the opportunity to continue on with the conversation right then. If you need assistance in starting that conversation or target marketing, please call me to discuss at 847-634-6535. Or use the contact form by clicking below. Mike is an incredibly talented LinkedIn expert. In the 10 years I have known him, he has been a trusted and valued advisor who has helped me advance my career online and off. Thanks Jack. It may feel like 10 years to you, but it is somewhat less, although I do cherish most moments we share.